The Za’atari Refugee Camp in Jordan is home to over 80,000 Syrians fleeing war and violence. Half of these are children. Clouds Over Sidra is the story of a 12 year old girl who has lived there since the summer of 2013. The film follows her to school, to her makeshift tent and even to the football pitch. Clou ds Over Sidra was initially created to support the United Nations Secretary-General’s MDG Advocacy Group’s call for partnerships to build resilience in vulnerable communities. 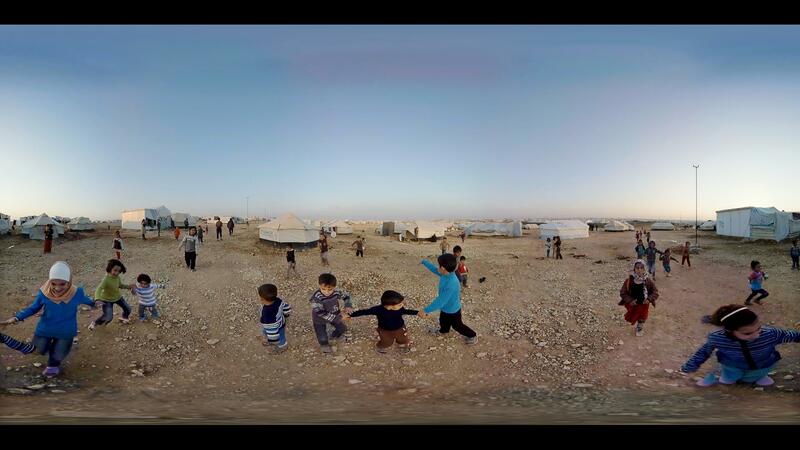 It’s the first ever film shot in virtual reality for the UN, using the medium to generate greater empathy and new perspectives on people living in conditions of great vulnerability. Its powerful capacity to allow anyone on a global scale experience life within a refugee camp has the ability to inspire the message of hope among not only the millions displaced but also those motivated to act. The film premiered at the World Economic Forum in Davos, Switzerland with supporters including UN Secretary General Ban Ki-moon and Norwegian Prime Minister Erna Solberg among other dignitaries. Since then, it has been widely used to advance the UN’s advocacy for the Syrian crisis. 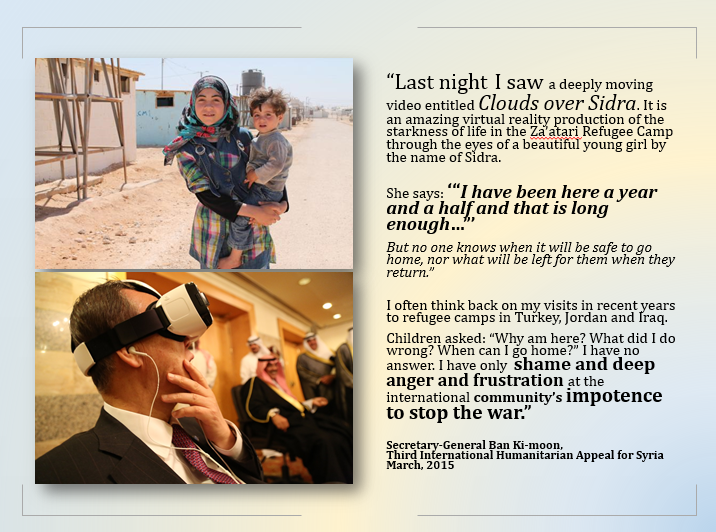 It was screened at a high level donor meeting prior to the Third International Humanitarian Appeal for Syria in Kuwait in March 2015, which eventually raised 3.8 billion US dollars. The UNICEF education team has used it to showcase the need to support children’s education in crisis situations at important education forums in the lead up to the post-2015 summit. It has been translated it into 15 different languages and it is currently screening in 40 different countries by UNICEF face-to-face fundraisers. Preliminary evidence has shown that VR is twice as effective in raising funds. Various civil societies have used it to influence public opinion. The SDG Action Campaign is exploring opportunities to expand UNVR’s use as an educational tool. It has been used to discuss the Syrian Refugee Crisis in classrooms across the globe, including South Africa, Argentina and during a refugees workshop in their Teen Thursdays Program, a collaboration between the UN Group Programmes Unit, and the NYC Department of Education. Clouds over Sidra is a collaboration between the UN SDG Action Campaign, UNICEF Jordan, and Hollywood Production studio, Vrse, It was co-created by Chris Milk and Gabo Arora. It is the recipient of the Interactive Award at the Sheffield International Doc/Fest. It was released on the VRSE application and iTunes and screened at the Sundance Film Festival, the Tribeca Film Festival, SXSW, the Museum of the Moving Image and countless UN forums and conferences.